Peace and Goodwill to All Beings! Noirin here, as Bhante is away in Sri Lanka on retreat. All well here, except for Maurice (our resident mole) who gave up the ghost a few weeks ago. Dreading the revenge of the worms, he came out onto the path to breathe his last. Another mole had expired on the path only a few days earlier - did Maurice die of a broken heart after losing Mrs. Maurice? Alas, their neighbours have no respect - fresh mole-hills in abundance! 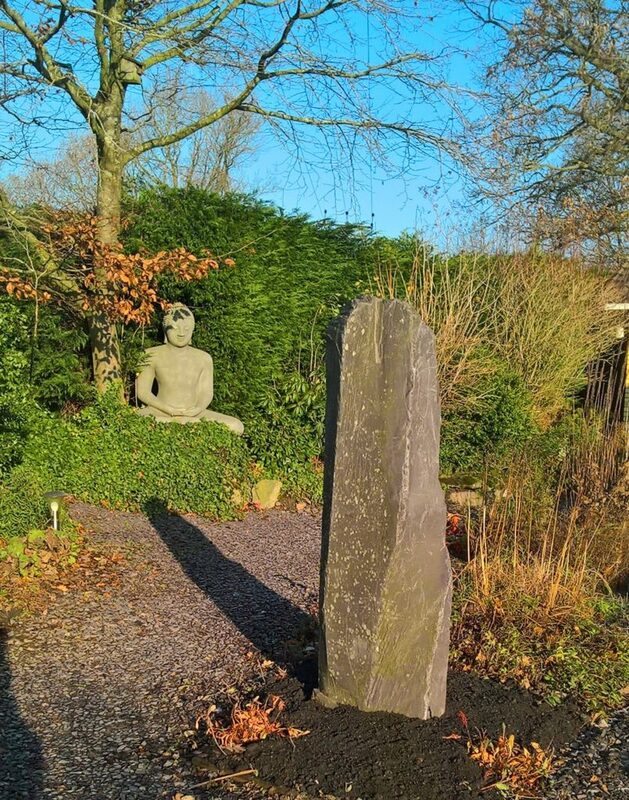 Luckily none in the front garden where the standing stone is now in place. Andy has planted new ground cover (persicaria "Darjeeling Red" for the gardener's among you - transplanted from Marion's garden) to integrate it into the flower-bed. By next year, the stone will look like it predated Satipanya! We sow seeds of kamma with every thought, word and action. What matters is the attitude that prompted us. We reap the kamma, both from the practical consequences of whatever we do, say or think about, and also because that attitude becomes more and more pronounced in our character. To get the best out of Christmas, we can look for opportunities to sow kamma-seeds associated with good-will (metta). As we’re writing Christmas cards, we can keep pausing to let any stress cool off, then make a calm good wish for whoever we are writing to. When we come up against suffering, metta takes the hue of compassion – we want to alleviate this. To sow these kamma-seeds we could purchase from a charity rather than from high-street shops. When we're celebrating, good-will takes the hue of mudita – appreciative joy. We might wonder what’s the point in celebrating Christmas – so much materialism. But we won’t gain any merit from scowling at the Christmas lights and tinsel! The world supports us as we walk our spiritual path - we can find some good in every situation. To sow seeds of mudita we appreciate whatever lifts our heart – even if it’s the glitter of tinsel! So long as it helps us smile through our meetings and greetings, it’s a bonus. We’ll reap that kamma by finding it easier to enjoy and be grateful for worldly blessings like having somewhere to live and food to eat as well as the spiritual blessing of friendship. Good-will can also take the hue of equanimity – the attitude we need when we come up against unskillfulness. Say we’re disgusted by the waste of the earth's resources in the Christmas frenzy. We could make the wish “May this waste not provoke my anger". We’re not pretending there’s no problem. We’re just preventing the problem from becoming our problem as well. We could project equanimity outwards e.g. “May our society learn not to squander the earth’s resources”. So we have four flavours of good-will with which to sow our Christmas kamma. Metta (friendliness), compassion, appreciative joy and equanimity. These four are termed the Brahma Vihara – the divine abodes. Each time we practice these, we brighten the world for a moment – and who knows what ripple effects may follow. One thing is sure - we sow a kamma-seed of good-will into our character. Divine abiding – sounds nice doesn’t it? What better gift to give ourselves this Christmas! please, look in spam or re-establish the email by filling in the form in MAILING LIST at the bottom of the front page of the website.